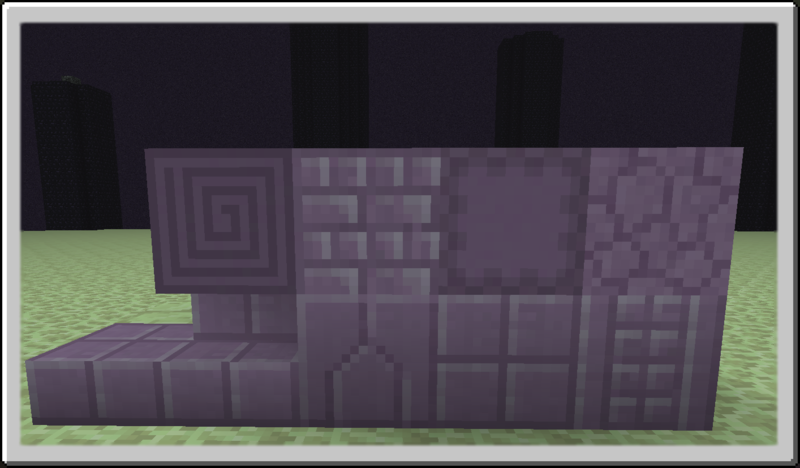 This is a very simple mod that adds some building blocks to The End, Something that it currently has very little options for. This mod was inspired by the End Stone variant textures made by Reddit user Evtema3, which I use. *Not applicable for 1.11 Version. 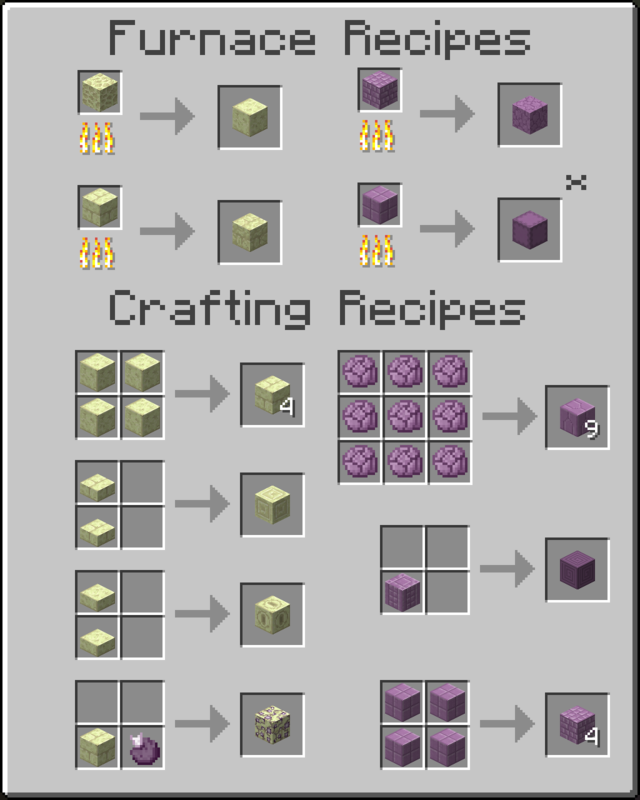 This recipe is replaced with 2 skulker shells, one on top of the other, and gives 4 Shulker Blocks. Stairs and slab recipes are the same as always. 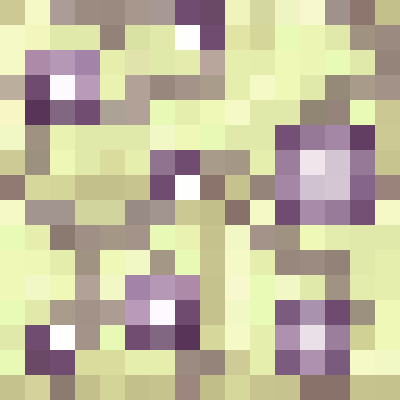 Note: This mod replaces the current recipe for End Stone Bricks with one closer to the one for stone. Hey, this is more of a nitpick then anything, but the slabs in this mod aren't showing up correctly in HWYLA. Also, if you use the pick block feature in creative, the slabs give you vanilla purpur slabs rather then what they are supposed to give. This is in the 1.12 version, it works fine in 1.11. Sorry to bother, just had a question I hope someone can answer -- does this mod add any sort of terrain gen to the end at all? It does not. I also don't plan on adding any generation. Question I asked was the only question I wanted an answer to. Thanks. Old comment, but damn your response was snippy. Just want to let you know, I'd still be super stoked if you updated this to 1.12! Any chance we'll get a 1.12 version of this? This is a nice mod but more stairs and slabs would be nice - I'd rather not use chisels and bits for that since that could get rather resource intensive. Other than that this is great! any chance you might add support for building bricks? which allows the creation of vertical slabs, quarter/eighth blocks, ect? 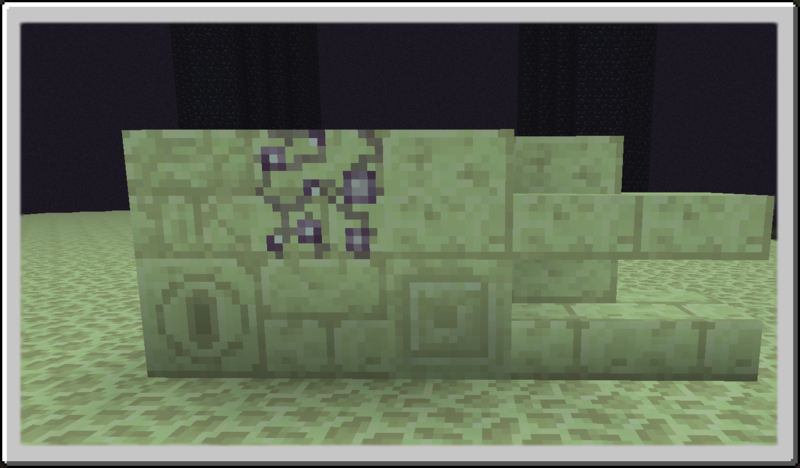 You should make it so some of the new blocks generate in End structures. i agree! probably the blocks should also hide some treasure hoards in end cities.